Invite bluebirds or wrens to vacation in your sanctuary by adding this Heartwood Verdi Villa Bird House to it. Placing a bird house in your yard or landscaping provides shelter to your feathered friends, helping them find safe nesting spots and maintain their population levels. This tapered unit, crafted from PVC, retains its bright white color and striking shape for many seasons, while providing birds a well ventilated and beautiful roost. Birds easily enter the unit through the 1.5" diameter opening on the front panel, and a verdigris, hipped roof fully covers the shelter to keep the nest dry. Additional PVC around the entry provides depth, deterring predators, and a verdigris guard rests atop the extension to keep woodpeckers from enlarging the opening. Drainage gaps on the base of the shelter help the nest stay dry and safe, and the white color of the body keeps the interior from overheating. The home attaches to a 4 x 4 post easily with its included mounting plate, and a back disc removes for seasonal cleaning. 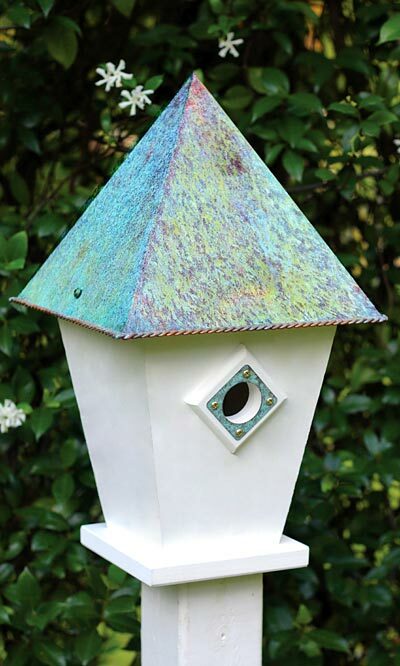 Add a splendid retreat for birds to your backyard with this Verdi Villa Bird House. Made in the USA.